Snooki Launches New Line of Sunglasses for Kids! New mom and reality star Nicole "Snooki" Polizzi is creating her own mini empire, with footwear, novels, soda, and tanning products all bearing her name. The latest addition to the "Snooki" by Nicole Polizzi line? The Enzos – Snooki sunglasses – for kids! Recently, Polizzi posted a giveaway on her website promoting her new line of sunglasses, exclaiming, "I will be launching a new children’s sunglass line, The Enzo’s! I am teaming up with Snooki Shades and NYS Collection to do a really cute contest where you show off your baby wearing a fun pair of sunglasses!" 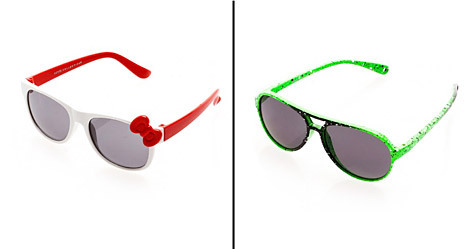 Snooki's sunglasses for kids include the Bowtiful style and the Lava look. PHOTOS: Amazing must-haves for Jersey Shore mom, Snooki! Since giving birth to baby Lorenzo back in August, the proud mama has been outspoken on matters of motherhood — talking about childbirth, breastfeeding, and everything in-between. It seems only natural that she&apos;d add a children&apos;s product to her ever-expanding product line. The question is — would you buy them for your kids? Celeb Mamas Like Beyonce and Gisele Let Loose on the Met Gala Red Carpet! April&apos;s Most Adorable Celebrity Baby Pictures!